GridLinesVisibility: Gets or sets the value of GridLinesVisibility property that defines which grid lines are currently visible (displayed). Both (default): Both horizontal and vertical grid lines are visible. GridLinesThickness: Gets or sets the thickness of the calendar grid lines. GridLinesBrush: Gets or sets the Brush value that defines the appearance of calendar grid lines. 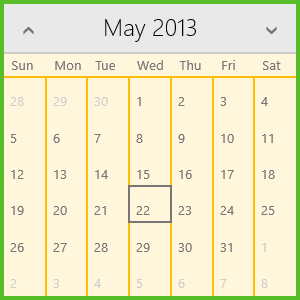 Background: Gets or sets the Brush value that defines the background of the calendar grid. BorderBrush: Gets or sets the Brush value that defines the border of the calendar. BorderThickness: Gets or sets the thickness of the calendar border brush.